Layouts Archives - Pebbles, Inc.
Hello everyone! 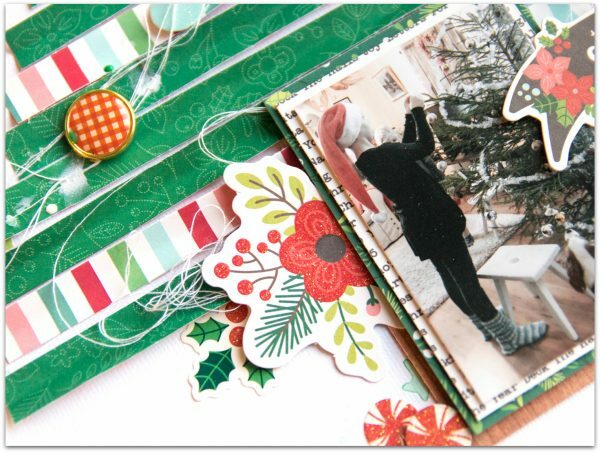 Terhi here with another layout telling some very precious memories of our Christmases. I’m desperately trying to limit all I’d like to share, so that’s why I decided to make a layout about the most special Christmas tradition our family has. Before you skip the story thinking this sounds too usual, I want to mention our tree tradition starts from going outside to real woods! We usually celebrate Christmas at my parent’s farm, and way before December we already take lovely fresh walks in forests choosing the right tree. It has to be wide, but not too wide. Green, and right age. Furry and thick, and lots of twigs to hang all decorations. And most importantly the right kind of top to hang the star! We can easily discuss hours about which one is the right one, and still my Dad complains about the decision afterwards. But it’s part of the tradition and I’d be very worried if Daddy would approve. To capture this story to the layout I chose one photo from last Christmas. Before printing I reduced the saturation and vibrance of the photograph to make it fit better to the layout. Black and white would have been ok too, but I like this kind of photographs! 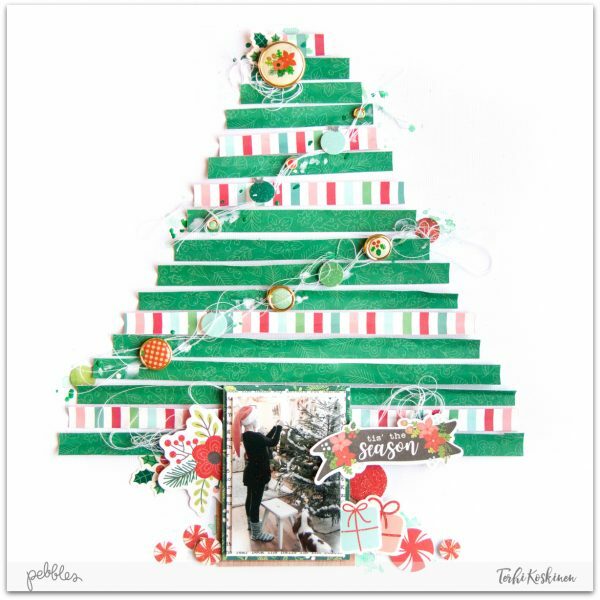 To make the tree background I cut several 1/2″ wide paper slices using couple lovely patterned papers from Cozy and Bright collection. Then, I folded each from the middle to make dimension. Very random look, and surprisingly it does give the idea of twigs. 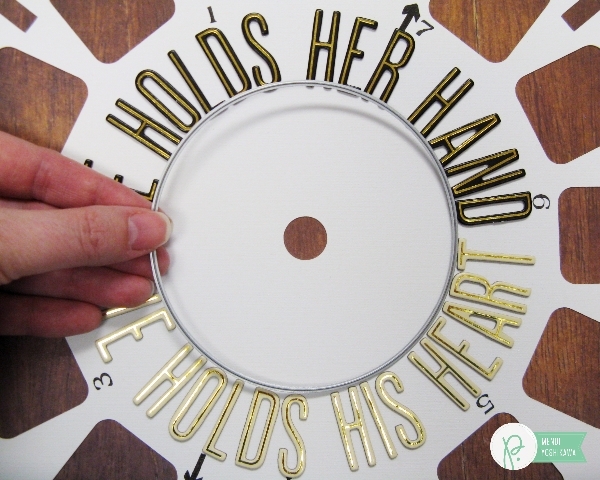 All the patterned paper slices are adhered onto the white cardstock using glue. 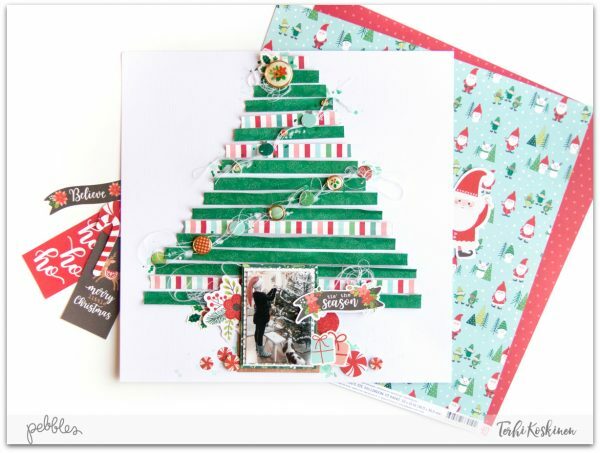 On top the twigs are couple of rows of thread with some embellishments – just like on our real Christmas tree! Cozy and Bright Brads are perfect for this. The photograph with couple patterned paper layers underneath it is a perfect tree trunk. I even added a layer of brown patterned paper just to make it look more tree. Rest of the scrapbooking process was simple, just added some more embellishments, the title and couple splashes of watercolors from same color scheme as the papers. Don’t see the journaling part? No worries, you’re not alone. Most of my stories are way too long to be written straight to layout, so I write them to the backside. No need to worry about messy handwriting or straight lines then! All these memories makes me so excited about Christmas! Just couple more weeks and the celebration can begin. 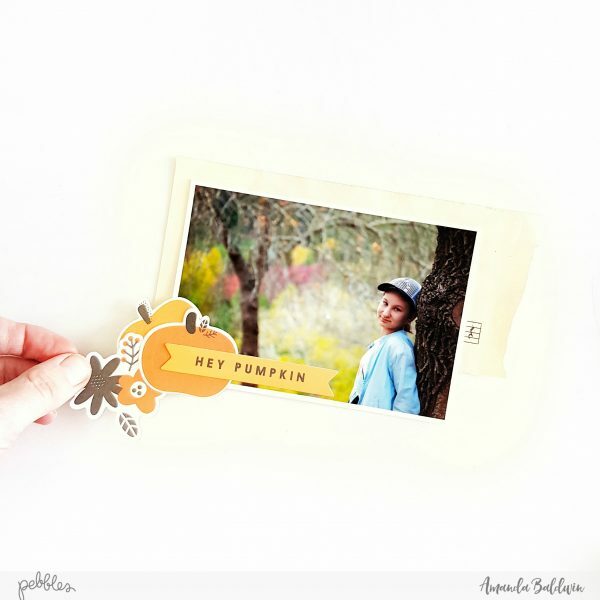 Fall Memory Keeping with Spooky Boo! 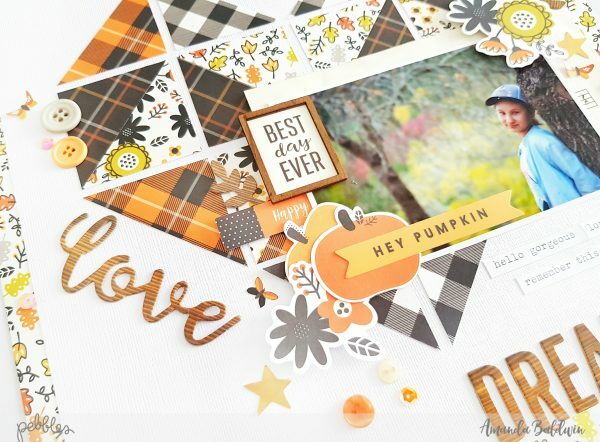 Amanda here, & today I have a super sweet Fall themed layout to share! 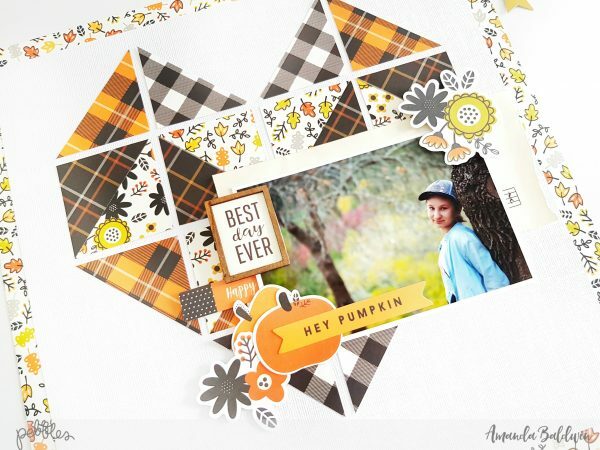 Created with our new Spooky Boo line, the warm tones and pretty plaids are sure to win your heart! 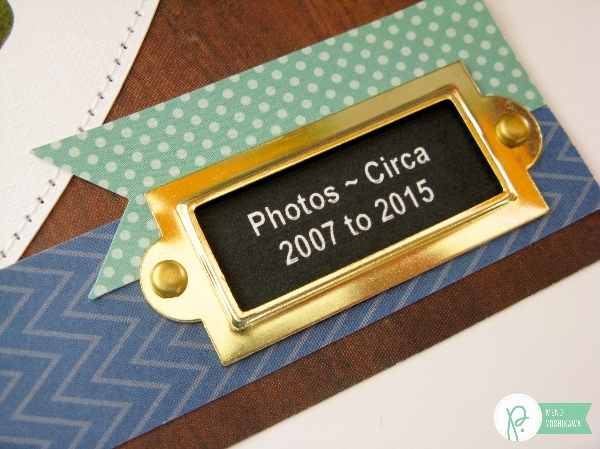 Isn’t this Halloween line just perfect for Fall memory keeping?! 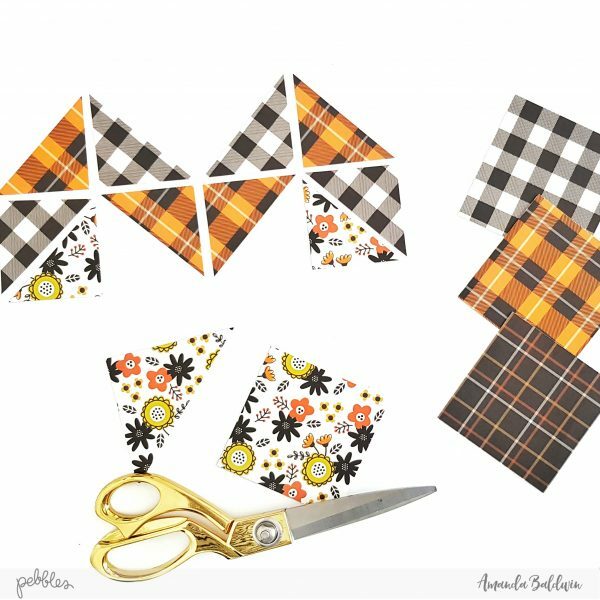 I was totally inspired by the Falling Leaves paper, as well as the plaid patterns, and my own memories of quilting and sewing in the cooler months. I love that this fun geometric heart design has a cut file appearance, but is actually created from hand cutting! Here’s how to recreate it…. Start by preparing the layout base. I select pattern paper Falling Leaves , and layer it with an 11″ x 11″ white cardstock background. 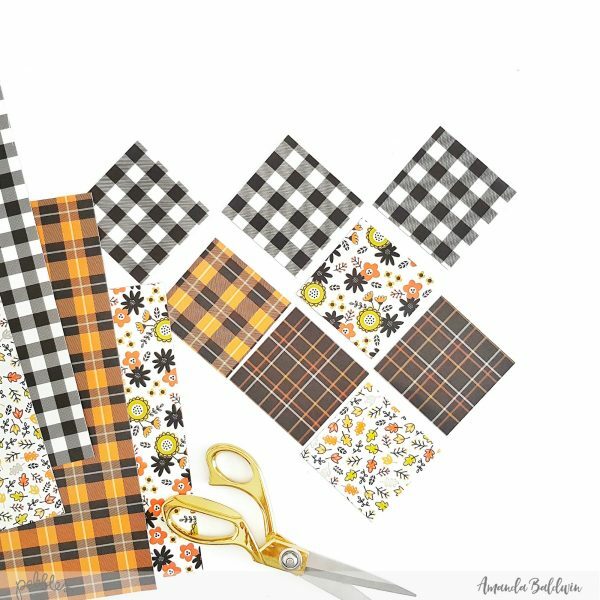 Next, select your Spooky Boo pattern papers, and then trim at least five 3″x 3″ squares. 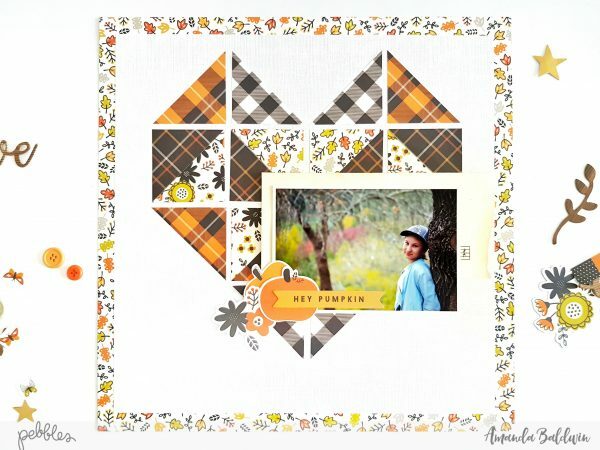 I chose papers Meow, Hocus Pocus, Hey Pumpkin & Falling Leaves for my layout. 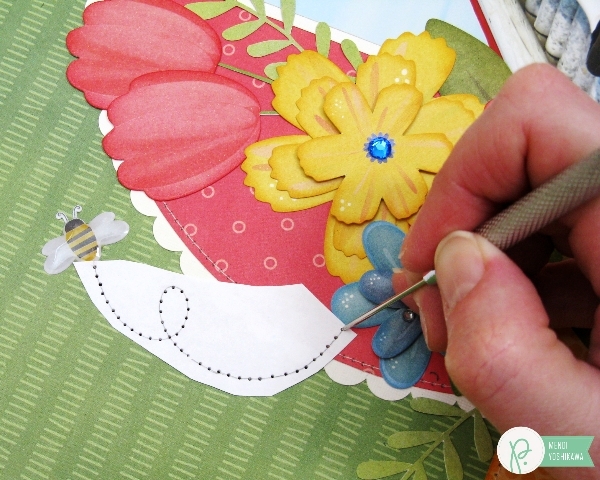 Trim each 3 inch square into equal triangle quarters by cutting diagonally. 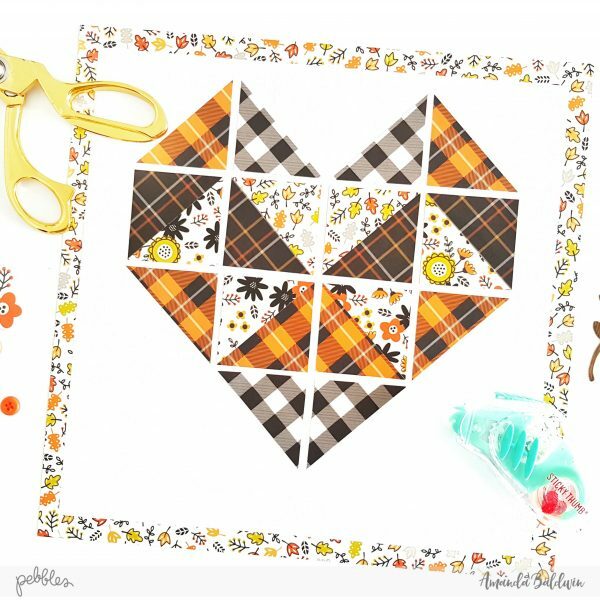 Take the triangles and arrange them into a geometric heart design. 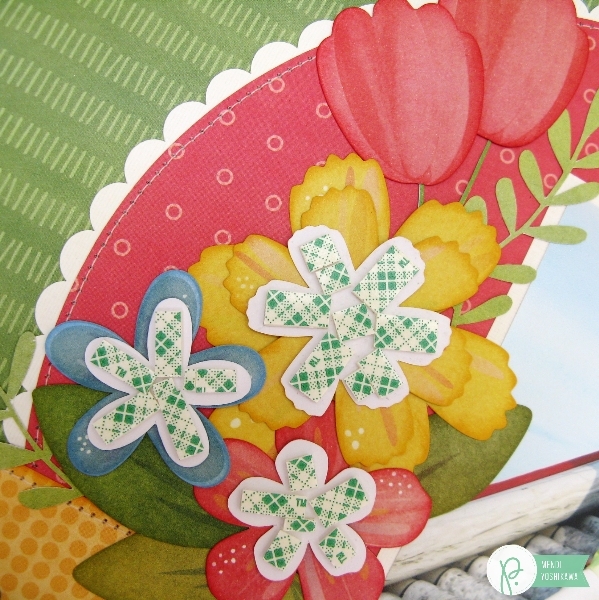 Play around with the patterns & design, and once happy glue into place. Prepare your photograph. 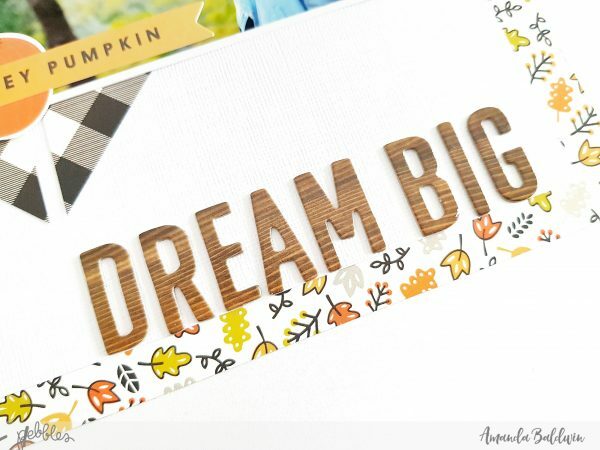 I use a layer of vintage book paper, and those super cute pumpkins from the Printed Cardstock Shapes pack. These pumpkins are actually Jack-o-Lanterns with spooky faces, so I strategically covered them with the sentiment and blooms. Perfect! Adhere your photograph to the geometric heart. 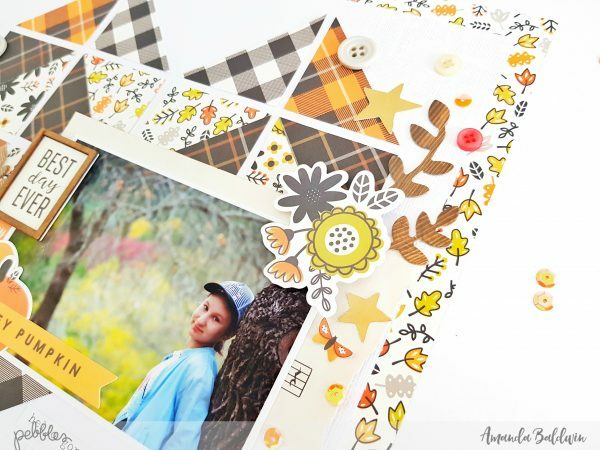 Embellish around the photo with more Printed Cardstock Shapes, as well as that gorgeous Wood Sticker from the Jen Hadfield Patio Party collection. The inclusion of the wooden embellishment really adds to the warm, outdoorsy, Fall feel of the layout. 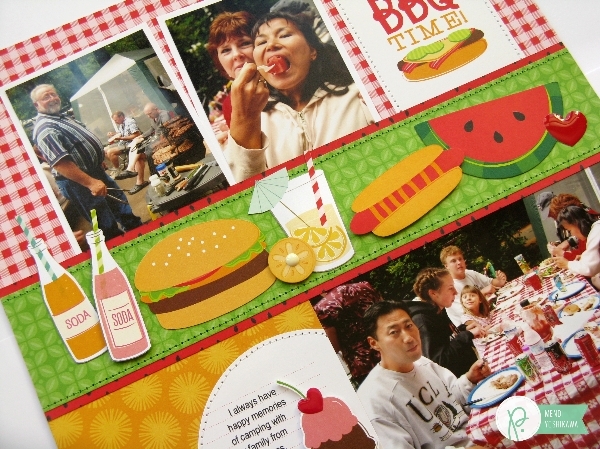 Add the layout title and subtitle, with the Patio Party Thickers. Again, the wooden appearance really emphasises the Fall look. I even add a few of the laurel leaves from the Patio Party Thickers into my photo cluster. So simple, and yet, oh so beauti-Fall! 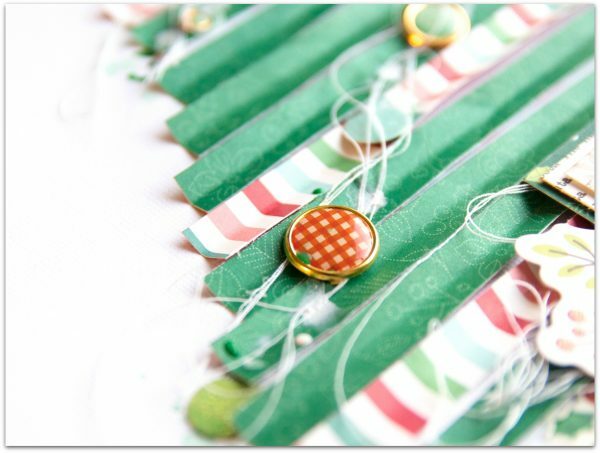 In keeping with the quilted look, I also embellish with buttons and sequins from my sewing box. Cute! 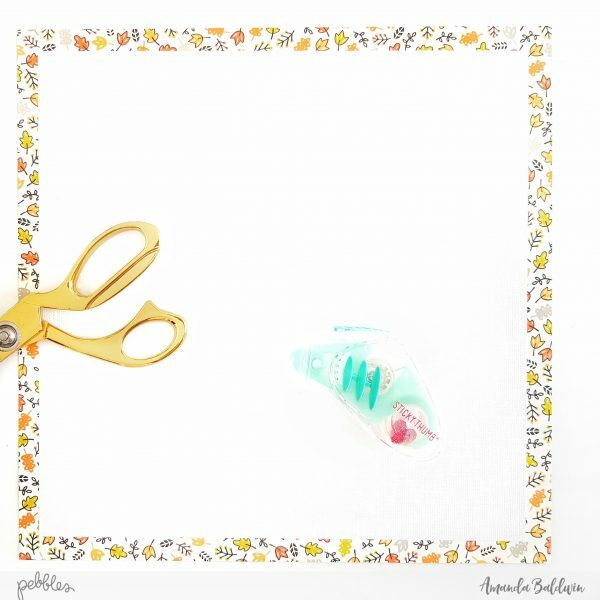 I add the gold stars from the Printed Cardstock Shapes pack, as well as a few tiny butterflies which I fussy cut from the barcode trim on the bottom of the Falling Leaves pattern paper. For final touches, I use my WeRMemoryKeepers Typewriter to add a little journaling beneath my photograph. Voila! 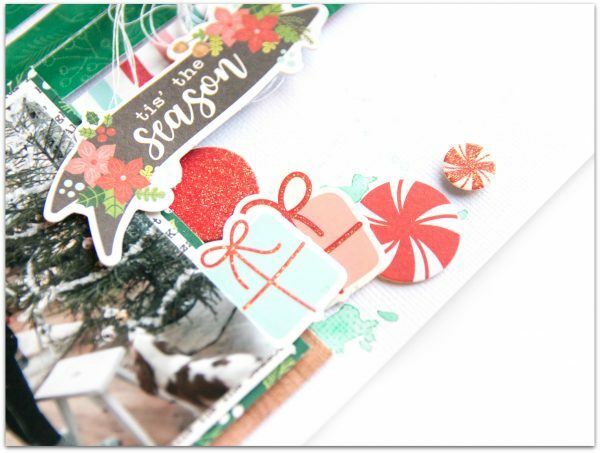 A lovely seasonal page that’s super easy to recreate! Love it! I hope I have inspired you to get creating with our beautiful products! Hello there! 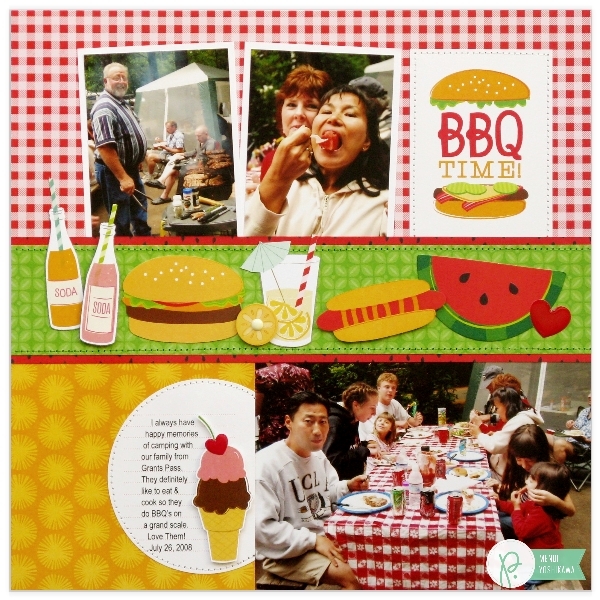 It’s Mendi here today with a Fun In the Sun summer layout that’s all about yummy BBQ comfort foods! I love nothing more than hanging out with my family and eating (with a little more eating) so I decided to create a layout celebrating every day moments like this one. 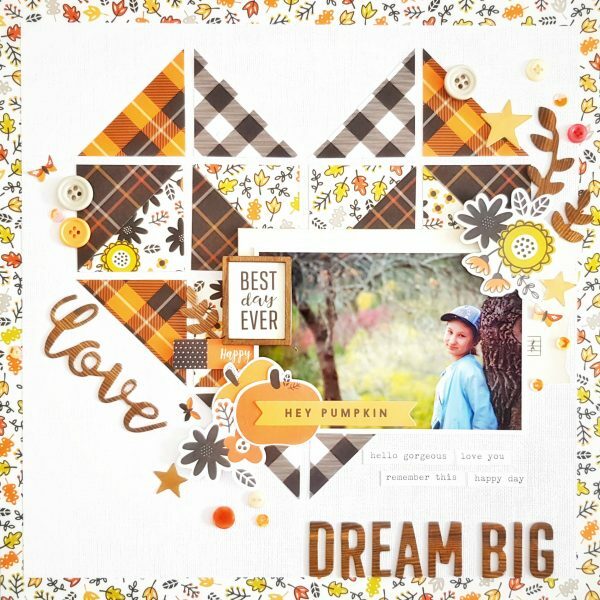 To tie my theme together I turned to all the adorable ephemera shapes in the chips pack and grouped them all together in one big border across the center of my page for extra impact. 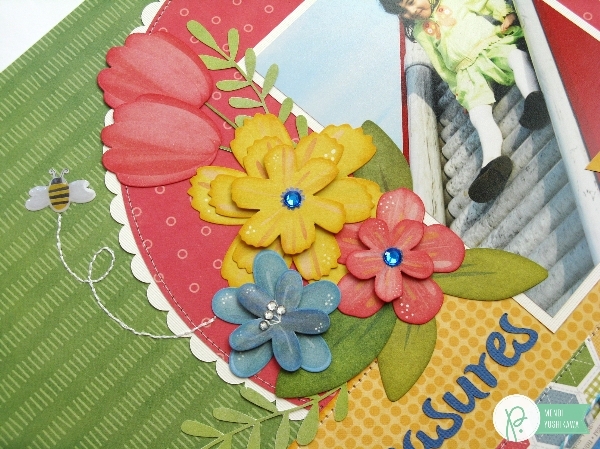 To create some depth, I popped some of the shapes up with foam tape and embellished with some enamel dots. 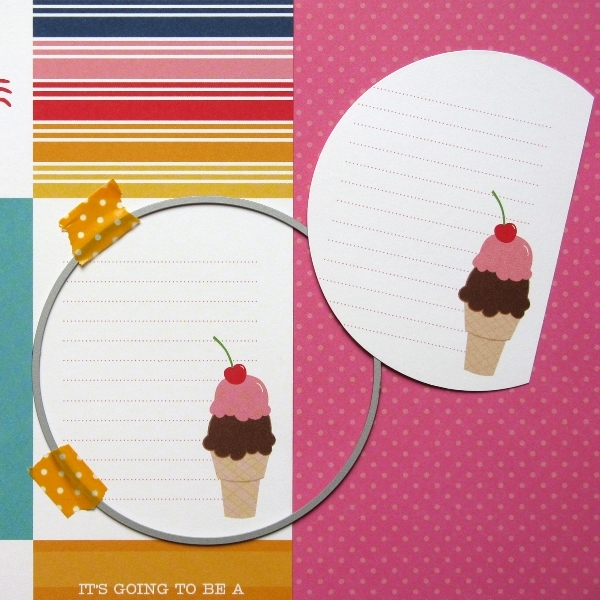 For my journaling I used one of the 3×4 cards found on the “Summer Days” cut apart sheet. 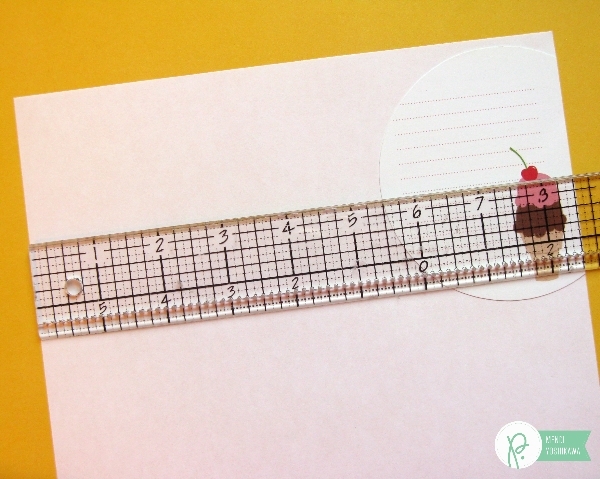 Ever want to know how to get your journaling to fit perfectly on pre-printed lines? For my journaling card I wanted it to be a semi-circle (based on a sketch by Nichol Magouirk which inspired me) so I grabbed my We R Memory Keeper nesting circle dies to cut it. I then adhered my journaling card to a piece of basic office paper and set to work measuring so I could know where to set my 4 page margins within Microsoft Word. For your top margin you will want to measure to the top of first line and to the bottom of the last line for your bottom margin. I knew I wanted to layer a cute die-cut on mine with some foam tape so I set the die-cut in place to measure my right margin. When all the margins are set, type out your journaling. Now the fun begins. Sometimes you must get creative in your spacing by playing with your font style and size. I started with Arial, but it took up too much room so I switched to Arial Narrow. It is important to count how many lines you have to fill and to not exceed that in your typed journaling. When I got it about right, I had a little extra space that I hadn’t used for bottom margin, but I was at my 12-line maximum so I played with my line spacing settings until the words lined up from top to bottom. All of this sounds complicated, but I swear it gets easier. With a little practice it can be done in a matter of minutes. Hello there! 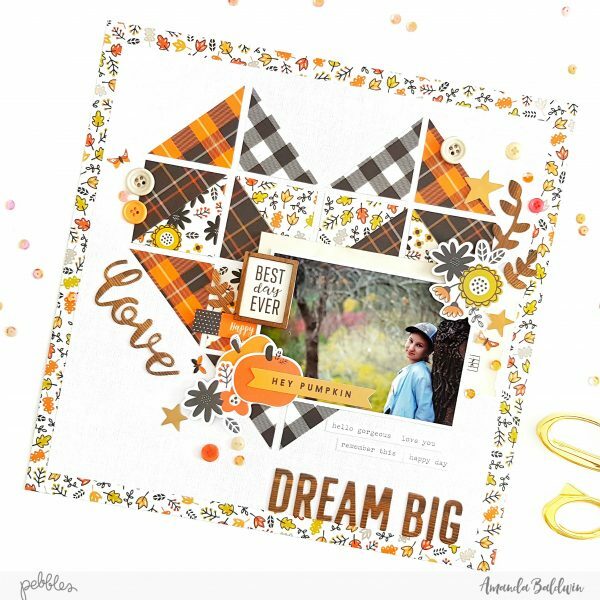 It’s Mendi here today with a fun and easy layout focused around an enlarged viewmaster shape using a mix of Pebbles Cottage Living and Happy Day collections. When Pebbles asked me to create a scrapbook layout for Father’s day I was a bit panicked. Our family is notorious about taking it easy and forgetting to document the day with photos. I decided that doesn’t mean I can’t still show my husband how much he means to me by using a photo collage of some of my favorite pictures of him over the years. To add a little extra detail and color, I added pennants to the bottom of my page with one of the beautiful gold metal labels. I have always been a huge fan of bookplates so I am excited to see these making a comeback! To tie in the black & gold Thickers, I printed my journaling using a white font in a black text box. Sadly printers can’t print in white ink so it’s a fun way to fake it. So do you want to know how I centered my title on the curve? I turned to a circle die (a bit larger than my journaling circle), wrote out my title on a piece of scratch paper and then counted to the center of each line. When I found the center mark, I was able to put down my letters down from the top, center part of my page (and again from the bottom, center) and work my way out on each side. I thought I would have to really work at repeatedly moving them to get them all to fit, but luckily they all fell into place with natural spacing and very little fuss. The circle die was the perfect tool to push my letters flush with and keep everything perfectly straight. When putting down my letters I just tried to imagine the center as a spoke of a wheel and to apply them radiating out from the center. When I was done and had the letters just the way I wanted them, the die easily lifted right out. For my journaling I used a circle shape to type my journaling in Microsoft Word so I could figure out how many words would fit on each line. 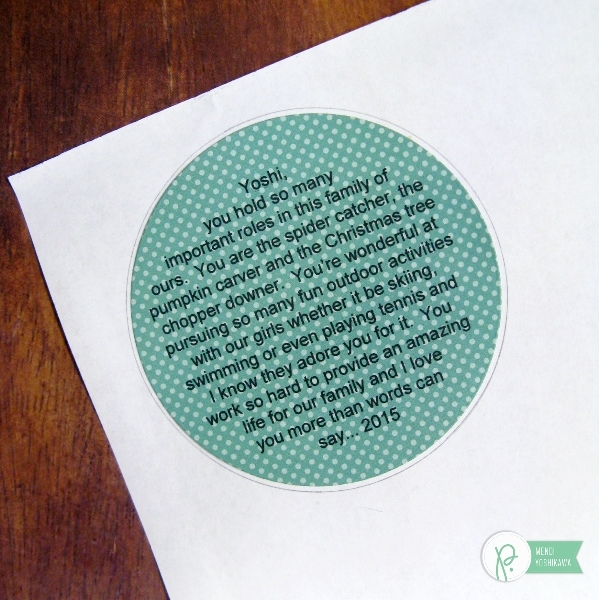 When I had everything just right, I changed my circle line to transparent (or no line at all) before printing. 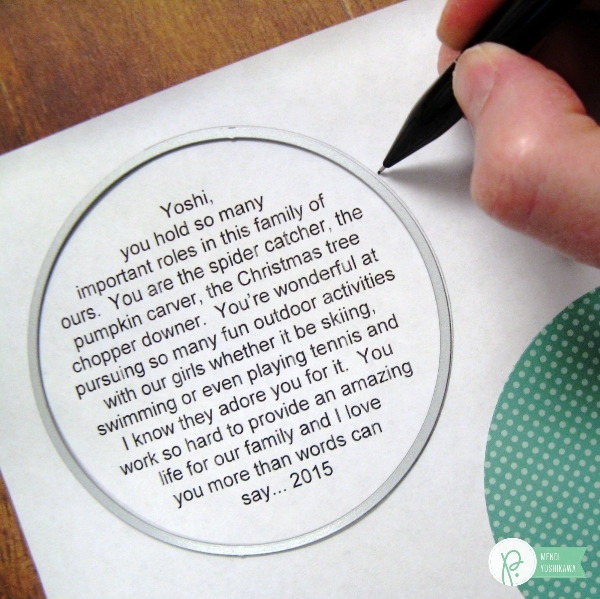 I then used the same circle die I had used to cut my patterned paper to trace a circle around my journaling. Since the die’s edge is slightly larger than where it actually cuts, it easily tells me where to adhere my die-cut circle and helps me get my spacing perfect. I then used photo splits to temporarily adhere my die-cut circle to my printer paper and ran it through my printer one more time. 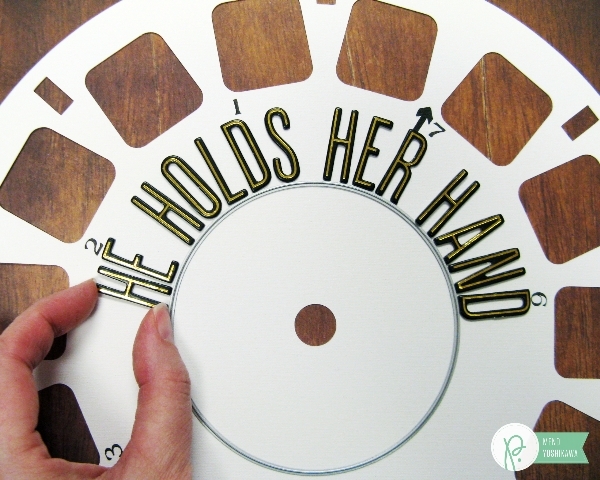 Photo splits are the perfect adhesive for projects like this because they are not too sticky and can easily peel off afterwards. Here’s one last look at the finished result with a parting tip. 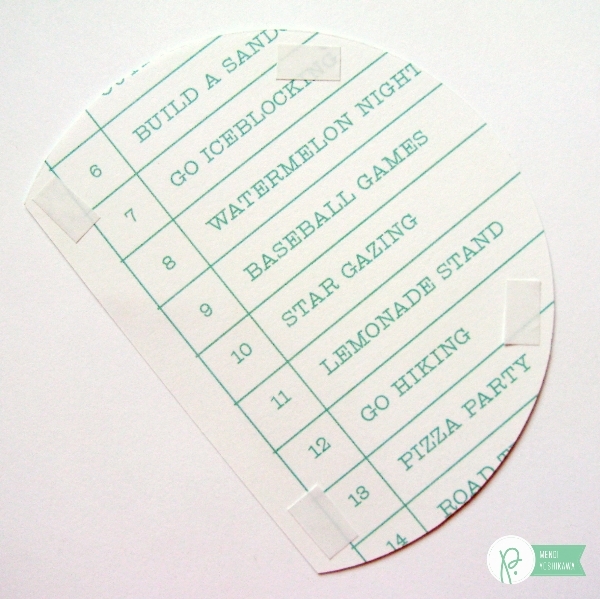 For my little photos I cut them apart leaving small borders around each and then taped them to the back of the viewmaster die-cut before adhering it to my 12×12 background. Hello there! 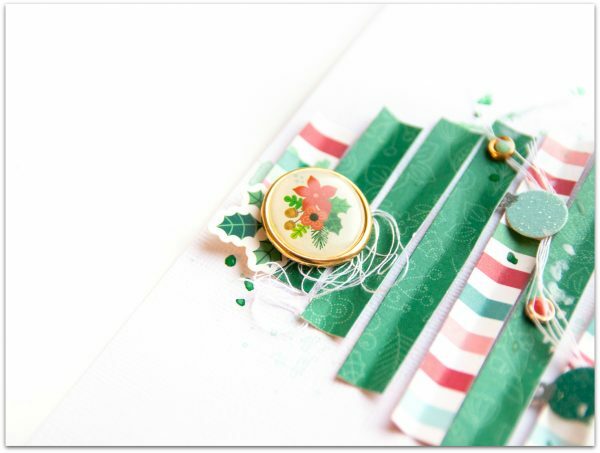 It’s Mendi here today with a Spring layout all about blooming flowers! For almost a decade we faithfully visited a local Tulip Festival, but sadly we haven’t made it for the past few years (something I think we need to remedy soon). 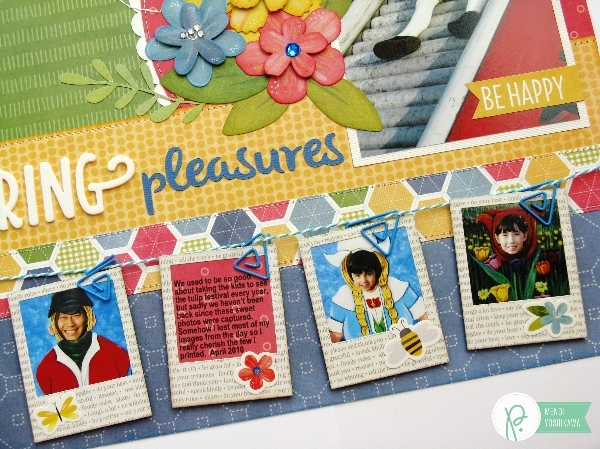 I wanted to create a special layout capturing the fun we had the last year we attended and I decided creating a beautiful floral grouping with the ephemera flowers was the perfect way to do this! I was looking for a way to fit more photos on my page so I chose to string a set of mini Polaroids along the bottom of my page. These were originally 2 full-sized 4×6 photos which I ruthlessly cropped down into (3) 2×2 inch squares. I love how downsizing them put the focus back on my family’s cute little faces and left me more room to include fun embellishments. 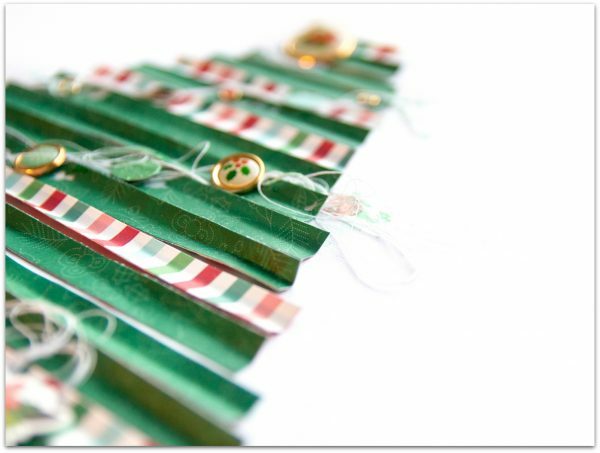 I adore the fun triangle paper clips that came with the Photo Garland kit. 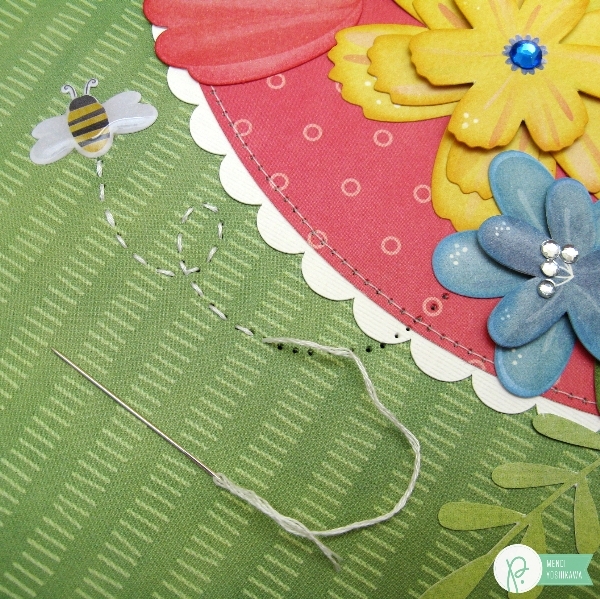 I often include banners on my pages so it’s nice to have a fresh way to mix things up! To bring my flowers to life and give them a more 3-D look, I chose to layer several of the flower die-cuts in the smaller sizes using foam tape. I also added soft chalk ink to my edges to make them pop and stand out when stacked together. 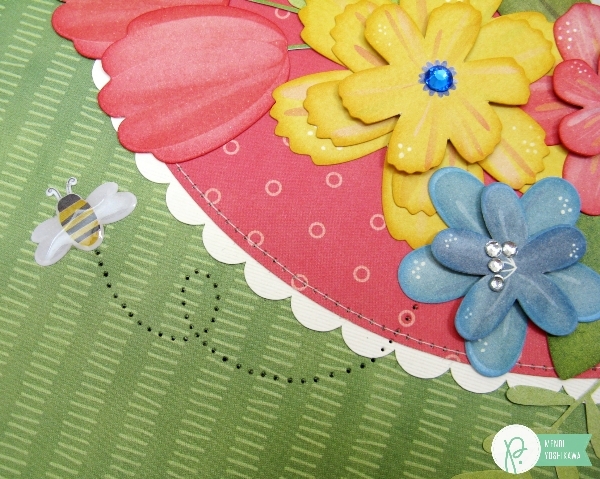 For my bumblebee trail I was really struggling to draw the perfect one directly on my background paper. After several attempts and erasing, I decided to experiment on printer paper. I loved the freedom this gave me to play without pressure. 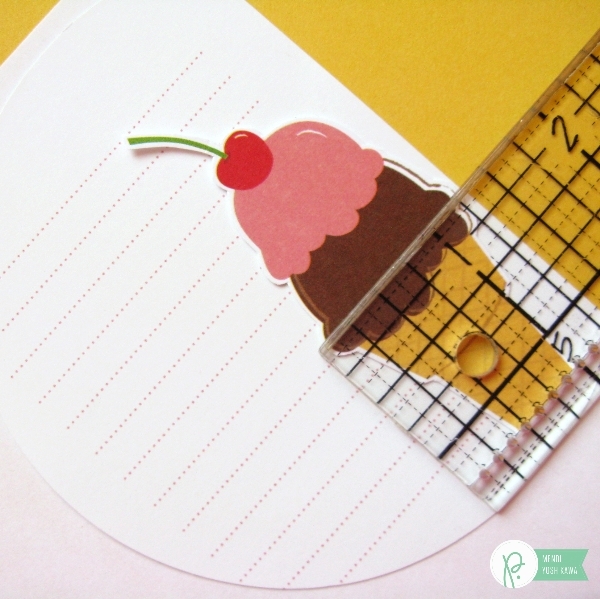 When I had one I was finally happy with I simply cut it out like a pattern piece, laid it in place and used my paper piercer to poke holes along my homemade pencil line template. Here’s what my page looked like after all my holes were poked. From there I took 3 strands of embroidery floss and stitched through my holes. Initially I wasn’t sure if I wanted to skip every other line or not so I started with a running stitch. However, in the end I didn’t feel like it stood out enough on my page so after reaching the end, I turned around my stitch and went back the other direction for a solid look.